Throughout this year's World Championships, O'Sullivan had continuously bemoaned his level of performance, even when winning. And this is nothing new. It has almost become custom for O'Sullivan to be congratulated in a post-match interview, only for him to complain that he played poorly. Even when regularly scoring century breaks, O'Sullivan has admitted that he is a perfectionist. But it seems that the only thing he has truly perfected is an ability to accentuate the negative. Added to this, he has also lamented his relationship with snooker, often stating that he has grown tired of it, with constant threats of retirement. These occurrences are far too many to mention. Now this would be extremely tiresome, but for the fact that the game of snooker would be a great deal poorer without O'Sullivan's presence and that these threats seem to be a symptom of the depression that he is said to have suffered from. While I don't know for sure, his mood swings towards the game and life in general strike me as a form of manic depression. 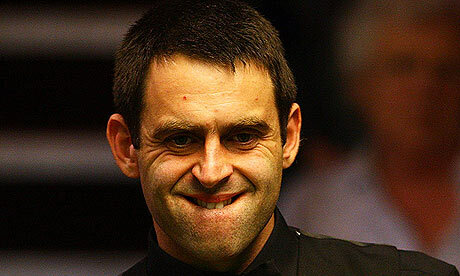 O'Sullivan first learnt to play the game as a young child in the snooker halls of Chigwell in Essex. He would go with his father, Ronnie Sr. and while his father would socialise with friends, Ronnie Jr. would be found at a spare table, playing alone, and knocking balls into the pockets with more skill then most of the adults in the place. Now it's a well known fact that snooker halls have a reputation for being frequented by, shall we say, some of society's more shady characters. Now my lack of factual knowledge means that I cannot infer a direct corollary here, but what is a fact is that O'Sullivan's father is currently in prison for murder when young Ronnie was only 15. A year later, his mother, Maria also served time for tax evasion. While he grew up in a working class area, where "men were men", O'Sullivan has always come across as quite a sensitive individual. Every interview I have ever seen with him has been punctuated by nervous pauses, biting of his nails and constant avoidance of eye contact. That is not to say that he is rude, just simple manifestations of his self-esteem issues. I know very little of the details that resulted in his father's imprisonment so I will refrain from any moral judgement. And it hasn't seemed to have damaged the relationship between O'Sullivan Sr. & Jr. If anything, absence seemed to have caused the heart to grow fonder. O'Sullivan has made no secret of how much he has missed his father, and from behind prison bars his dad has taken an active interest in his son's career. While the sporting success of the younger O'Sullivan seems to have cemented the bond between father and son, I wonder if it's also part of the problem. Imagine being a young boy, getting to go and play with Daddy and his mates. You're a bit of a sensitive kid so when he tells you to go and entertain yourself so that he can talk with his friends over a few beers, what do you do to avoid being left out? By their very nature, children imitate. It's how we learn to function in the world, copying everything around us until we reach a point where we are able to find our own way. This young boy was surrounded by snooker paraphernalia. It was just chance or fate that he happened to have been born with an innate ability to play the game. All of a sudden, O'Sullivan Sr. realises that his boy has a special talent. O'Sullivan Jr. has made his father notice him and the boy has now received validation. This is the equivalent of a child getting their scribblings put up on the fridge at home. O'Sullivan Sr. is set to be released from prison soon and O'Sullivan the younger thinks that it will be just what he needs to reignite his motivation for snooker. While this may end up to be the case, I think it could also have the opposite effect. Ronnie O'Sullivan has spent all his adult life without the person who was meant to teach him how to be a man. And a lot of that time has been spent miserable, hampered by insecurity and self-doubt. Now that 'the prodigal father' is about to return, will O'Sullivan find a balance in his life that will quell his competitive juices? Despite many believing that he remains a talent unfulfilled, he has still achieved a great deal, winning three World titles, and financially securing his own future, as well as his family's. I have always got the impression that part of the reason that O'Sullivan has often been so negative when people have tried to bestow plaudits upon him, is that he is interested in one man's approval only - his father's. Ronnie has made a success of his life, and has managed to do it without his father by his side. Now that Ronnie Sr. has finally paid his debt to society, Ronnie Jr. may feel that he has paid a debt of his own making to his father and his family. I think he has only ever sought his approval. Maybe now with his father's imminent release, he can also find some peace of mind. - Barcelona secured a second successive Spanish League title over the weekend, with an impressive 4-0 win over Valladolid on Sunday. Not only did it have one of the finest goals I've seen all season from Pedro Rodriguez, but it included a double for Lionel Messi, taking the Argentine to a whopping 47 goals this season. This has equalled the club record of the Brazilian, Ronaldo, who scored an identical number of goals in the 1995/96 season. While Barca were not as impressive this time around as the treble winning team of last season, Messi has been simply magical. He has added a ruthless finishing edge to his wondrous technical skill. We may never see as prolific a scoring season in any of Europe's major leagues for years. Regardless of what Messi produces (or doesn't produce) at the World Cup, we should give him due praise for a truly remarkable season. - On Saturday, Inter Milan will face Bayern Munich in the final of the Champions League, club football's showpiece occasion. Inter's Jose Mourinho will pit his wits against Bayern's Louis Van Gaal - interestingly enough, it was Van Gaal who gave Mourinho his first coaching post when the Dutchman was in charge at Barcelona. This season Inter have won both their domestic league and cup. Bayern have done the same. One of these sides will complete a historic treble in the Santiago Bernabeu on May 22nd. But somehow I doubt that either manager will get the appropriate congratulations for achieving this. While Sir Alex Ferguson was correctly feted as a managerial great for winning the treble back in 1999 (indeed, he got a knighthood off the back of it), I am yet to see Barcelona's Josep Guardiola be lauded in a similar way, even though his accomplishment last season was identical to Ferguson's. Maybe we can look at Europe's elite with a more objective eye this time round, stop complaining about the English failure in this season's competition and realise that regardless whether it's Mourinho or Van Gaal, one of these men will enter the managerial Hall of Fame on Saturday.